Achieve a salon-worthy mani from home with the limited edition nails inc. 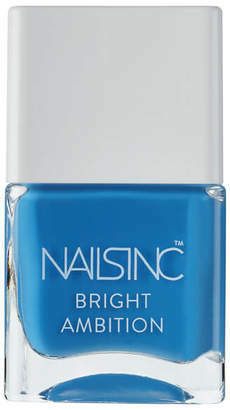 Bright Ambition lacquer in Not Invited ; an intense sky blue. Formulated in the brandâ€™s revolutionary long-wear formula featuring non-fade, non-dulling technology, the full-impact nail polish delivers bold colour with a mirror-like glossy sheen. Applied with the brandâ€™s patented wide-hugging brush, the formula glides effortlessly onto nails for a professional finish.